Back in 2017, a report from the McKinsey Global Institute revealed major productivity issues in the construction industry. Large projects exceeded budget by 80 percent. Completion time of structures took 20 percent longer than scheduled. In addition, the findings indicated that in two decades, labor productivity had only grown by 1 percent. In comparison, growth for the total global economy was 2.8 percent. Since then, builders have been exploring ways to improve operations by leveraging technology. One of the solutions companies have turned to is applications on the Internet of Things (IoT). 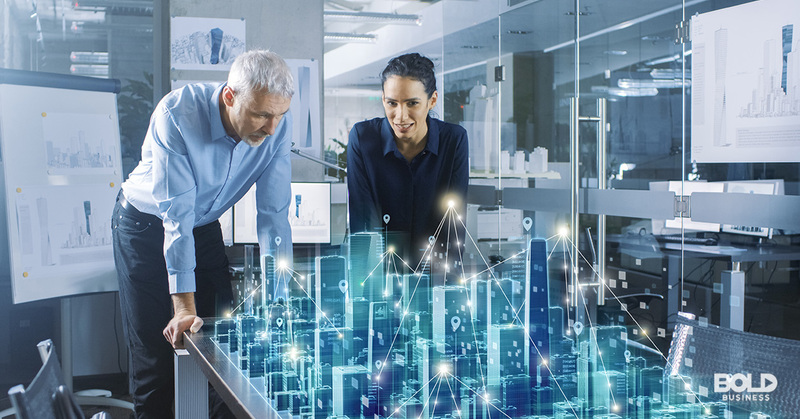 Indeed, in the era of the Fourth Industry Revolution, IoT in construction has been connecting machines, materials and staff for increased efficiency and reliability. Clearly, this technology is one of the key drivers that can boost productivity in the space. In fact, once productivity in construction grows enough to match that of the total global economy, the industry’s value could reach an estimated $1.6 trillion. Undoubtedly, the many applications on the Internet of Things or the presence of IoT in construction are worth digging into. Applications on the Internet of Things have made construction more efficient. There are several applications of the Internet of Things in the pre-construction stage. Companies and consumers are increasingly making operational efficiency the top priority. As such, IoT in construction has been influencing important decisions when it comes to design and planning. One of the most prominent use cases of IoT in construction is in building information modeling (BIM). The process involves the generation and management of digital representations of built assets. BIM provides intelligent 3D models. The models help in evaluating systems and structures by extracting data from IoT sensors in existing projects. For instance, there can be sensors for energy usage patterns, temperature trends or people movement throughout a building. Analyzing information from BIM is useful in applying design improvements to future projects. Moreover, BIM makes updating building plans easier. If there are updates in one part of a plan, they will simultaneously reflect in every other iteration of it as well. 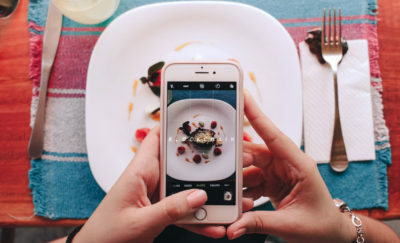 The interconnectedness of devices and sensors makes such real-time updates possible. One of the most notable use cases of IoT in construction is in building information modeling (BIM). Indeed, planners are now designing structures with features that allow for greater efficiency. Some buildings can automatically shut down their systems when unoccupied. Others can even be programmed to open and close louvers to let in natural lighting. Unnecessary delays in construction projects could translate to huge additional costs. Late deliveries, equipment malfunction and human error are some of the factors that can cause delays. Data, communication, and alignment enabled by IoT can help eliminate these factors. Through various applications of the Internet of Things, construction companies can capture critical performance parameters. Measuring the number of people and the amount of work going on at the same time can improve productivity. Information from IoT in construction can lead to better project insights. As a result, integrated and streamlined solutions become more achievable. 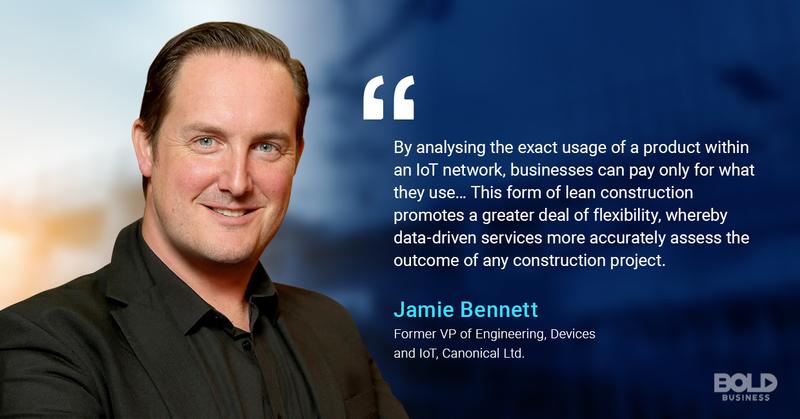 Jamie Bennett weighs in on one of the benefits of IoT in construction. Simply put, IoT in construction allows different elements on the site to talk to a central data platform. Advanced sensors on machinery can also detect the need for repairs. They can send automated alerts for preventive maintenance. In turn, preventive maintenance leads to several advantages. Effectively controlling costs and service intervals can be simpler. Minimizing downtime means maximizing almost every second during operations. Lengthening equipment life can even add resale value. Better inventory management and ordering are also among the advantages of employing IoT in construction. Connected systems can inform site managers when stocks are running short. NFC tagging and tracking can help pinpoint the location of materials. Integrating physical and electronic inventory is also possible. Moreover, increased safety is one of the most notable applications of the Internet of Things. Data gathered from IoT devices can help managers to better understand the risks of work-related injuries. For instance, wearables can send alerts if drivers and operators are falling asleep. Caterpillar Inc. is one of the most well-known companies that take advantage of the latest construction technology. 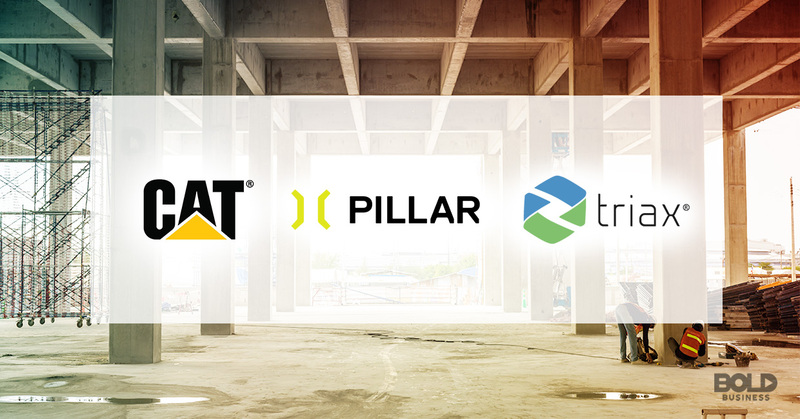 The heavy equipment manufacturer has an IoT technology and services toolkit called Cat® Connect. The solution gathers near real-time data about equipment performance. This case leads to improved efficiency and safety for Caterpillar and its partners. Additionally, all the data collected from the company’s IoT devices allow partners and consumers to access insights and analytics en masse. 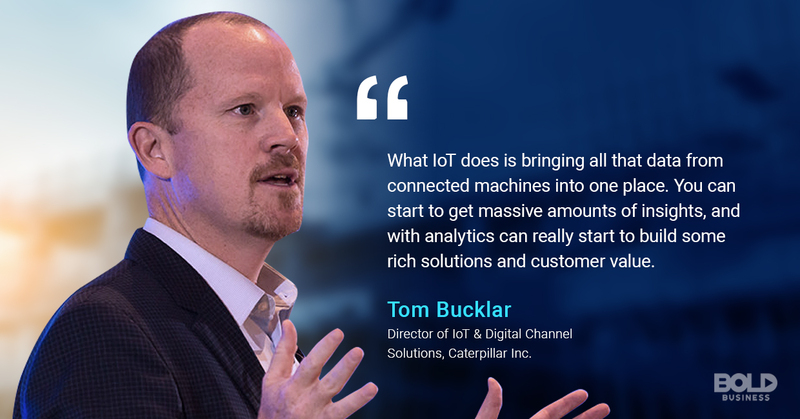 Tom Bucklar emphasizes how IoT in construction is benefiting their company. Pillar Technologies also helps builders use IoT in construction. It deploys job site sensors and provides a software analytics platform. These offerings allow measurement of temperature, humidity, pressure, dust, and noise. Pillar also notifies contractors of sudden changes in levels through their smartphones. The real-time updates can lead to immediate prevention of damages in the construction site. Another company that leverages applications of the Internet of Things is Triax. It offers an end-to-end solution for site safety called Spot-r. Their flagship wearable device is the Spot-r Clip. It detects falls at the job site. It identifies who fell, where the fall happened and the distance of the fall. The Spot-r Clip reportedly improves injury response time by up to 91 percent. Workers can also signal distress to designated supervisors from anywhere on site. Additionally, the device connects to the Spot-r network to provide real-time workforce location by floor and zone. Without a doubt, IoT in construction can unlock productivity advancement in the sector. 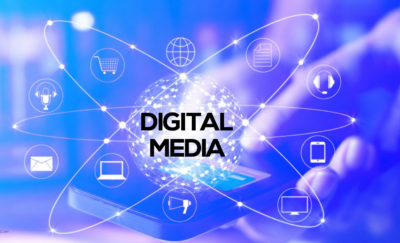 To ensure its maximization, businesses in the space must invest in reliable connectivity. 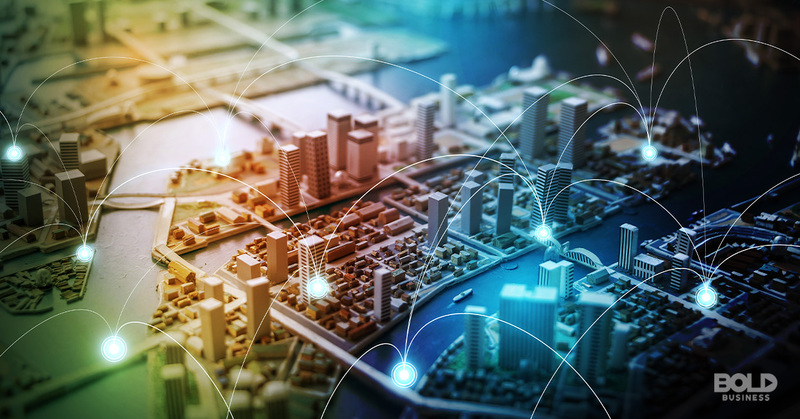 Once an IoT device loses connectivity, it can affect the entire operation. For more on Bold Business’ series on the Fourth Industrial Revolution, check out these stories on Nanotechnology Applications in Manufacturing and 3D Printing And Additive Manufacturing Technologies.